Enjoy a healthier smile with our Premier Dental Cleanings. Keeping your teeth and gums healthy is a huge priority for us here at South Bay Center for Aesthetic Dentistry. Our thorough and effective dental cleanings remove plaque and tartar buildup on your teeth, which not only helps prevent cavities but also promotes gum health. Our hygienists are very gentle when performing dental cleanings. In fact, with our laser dental cleanings, you’ll hardly feel a thing as they quickly and efficiently clean and polish all of your teeth. Each dental cleaning at South Bay Center for Aesthetic Dentistry also includes an exam with Dr. Mileham to check for cavities, oral cancer, gum problems, bite problems and other issues that may need attention. If needed, we can schedule future appointments for fillings, crowns or cosmetic procedures. 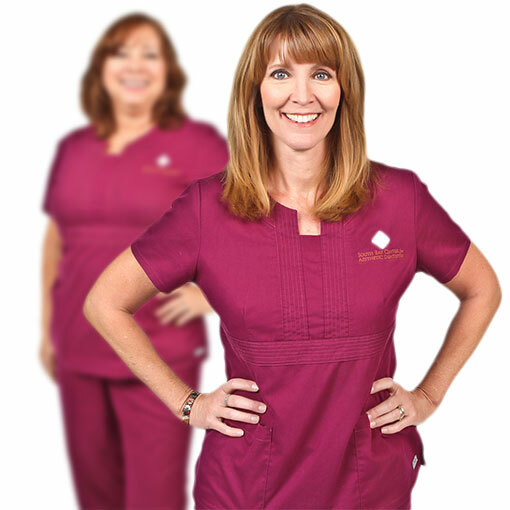 Dental Cleanings are a breeze with our gentle hygienists. At South Bay Center for Aesthetic Dentistry, you don’t have to dread your routine dental cleanings in Rancho Palos Verdes. Our skilled and caring dental hygienists make dental cleanings a relaxing, almost spa-like experience with their gentle touch and friendly demeanor. You can rest peacefully as the hygienist removes plaque and tartar from your teeth using highly efficient and painless laser dental cleaning tools. You won’t have to worry about metal tools poking and prodding your gums and causing irritation. Once your teeth are clean, we will polish them to make sure you leave our office with a gleaming smile. If your routine dental cleaning reveals problems like cavities, chipped teeth or severe tooth decay, you can trust Dr. Mileham to handle these issues professionally and thoroughly. Dr. Mileham can provide white composite fillings to seal up cavities, as well as root canals, crowns or even dental implants to correct more serious problems. A dental cleaning in Rancho Palos Verdes is also a great opportunity to explore cosmetic dental procedures. For example, many patients opt for professional teeth whitening services after a dental cleaning, because the treatment is most effective on clean teeth. If you have any questions at all about your oral health or the appearance of your smile, feel free to bring them up with Dr. Mileham after your dental cleaning. At South Bay Center for Aesthetic Dentistry we can provide skilled dental care for the whole family, from kids to teens, adults and seniors. While dental cleanings are important at any age, some of the things we look for during the cleaning and dental exam may change based on the patient’s stage in life. For example, we pay special attention to the condition of molars during a kid’s dental cleaning in Rancho Palos Verdes, because this is where cavities most often form. For seniors, we focus on keeping existing teeth clean and healthy and postponing the need for dentures as long as possible. Our entire staff looks forward to developing a lifelong relationship with you and your family. Just contact us to set up your appointment.